Can we even get a warning? A super-eruption that rocked the Yellowstone area in Wyoming 640,000 years ago spread ash across half the United States, and created a cloud of ash, dust and sulfuric acid that must have cooled the climate for years. Ditto for Long Valley, California, 760,000 years ago. Long Valley, California, has had the kind of super-eruption that can change whole states and even the climate. 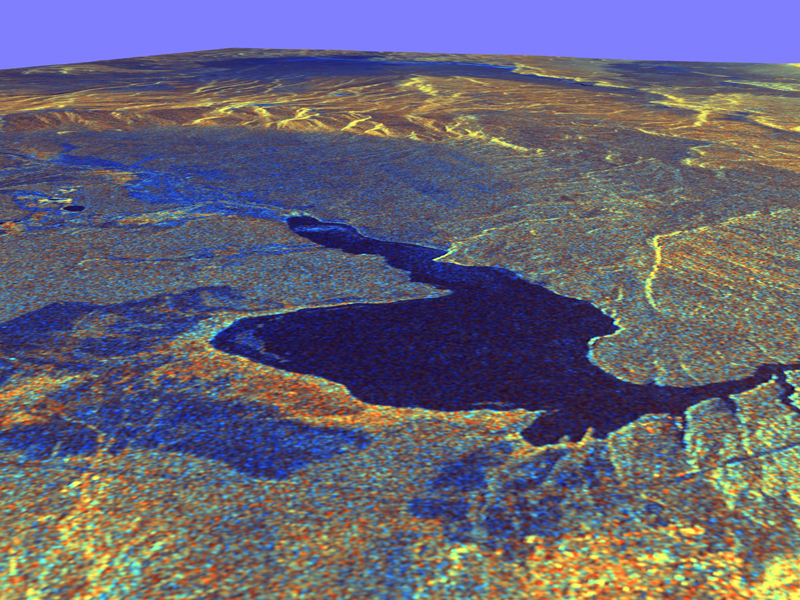 This three-dimensional view of Long Valley was created from data taken by synthetic aperture radar on a space shuttle. Super-eruptions are barely-conceivable outbursts that are fueled by a huge pool of molten rock near the surface. The most recent occurred about 26,000 years ago. A super-eruption may contain more than 1,000 cubic kilometers of dust and ash, 1,000 times as much as Mt. St. Helens, and 10 times more than Tambora, the volcano in Indonesia that caused Europe’s “year without a summer” in 1815. Our ancestors survived the super-volcanoes, but the human footprint on the landscape has grown so intense that a rerun could terminate civilization, largely by climatic cooling. The first hints of the super-volcanoes came from rings of mountains 30 to 60 kilometers across, which resembled stupendously large versions of the ring-shaped calderas on “regular” volcanoes. Until now, geoscientists have thought that the magma, once it formed or migrated close to the surface, would take roughly 100,000 years to erupt, which might give us some way to anticipate the inevitable tragedy. No swimming: Such pools of molten rock may be tens of kilometers in diameter, and up to three kilometers deep! Looking at a volcanic rock called tuff around Long Valley Caldera, Gualda and associates used several techniques to analyze the timing of melting and refreezing in the molten rock, and concluded that the eruption likely occurred hundreds or thousands of years after the magma began accumulating. Volcanoes occur when a giant dollop of molten rock forms at shallow depths, then eventually bursts through to the surface. In a super-eruption, the same process is thousands of times more massive than eruptions during the past century. The new schedule assumes that the magma that powers the eruption was rocks of the crust that were melted by heat from Earth’s mantle underneath. As crystals form in the molten rock, atoms can diffuse inside them, but after the eruption, the magma cools, freezing those atoms in place. Left: Chunk of pumice from Long Valley tuff contained the quartz crystals at right, shown immersed in oil. Normally, the level of impurities varies from place to place inside a crystal, but during prolonged heat, the impurities can migrate, allowing their concentrations to balance out. Therefore, measuring the concentrations and location of impurities provides a geologic “clock” that shows how long the magma remained molten. “We are dating the amount of time that passed, from the inception of the magma body, to its destruction by the eruption,” says Gualda. In this case, Gualda and colleagues measured titanium, an impurity in the common crystalline rock quartz. “Titanium is a great marker,” says Gualda. “When it goes from 750° C heat to 0° C, after the eruption, that halts the diffusion.” By studying the titanium profile and comparing it to laboratory measurements of titanium migration, it’s possible to calculate how long the crystal remained hot enough for the titanium to move. 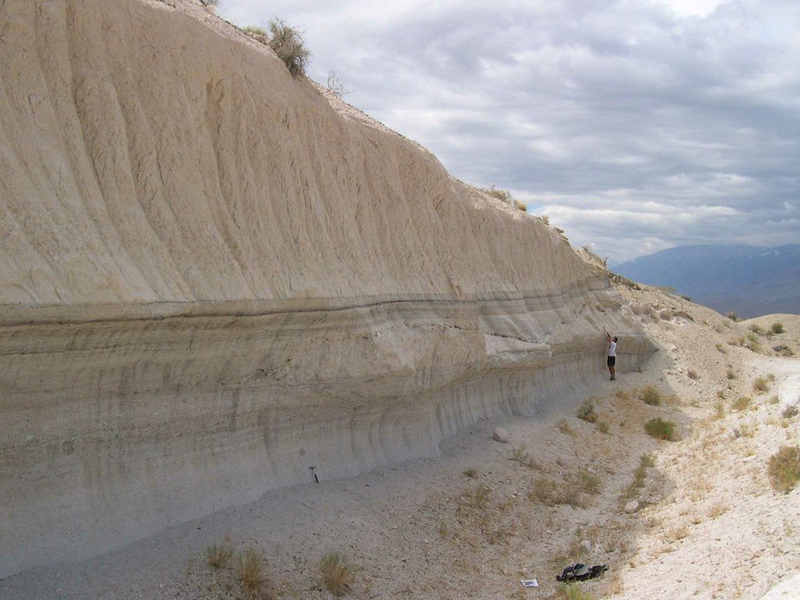 Bishop tuff at Long Valley shows ash-fall deposits that “rained-down” from atmosphere at the bottom. Above, the un-formed deposits are ash-flow deposits, formed by hot clouds that travel close to the surface. The new calculations, Bindeman says, “hinge upon the diffusion coefficient of titanium in quartz in experimental estimations.” Diffusion can vary exponentially, and a 10-fold decrease in the diffusion coefficient will change the results by a factor of 10, he says.